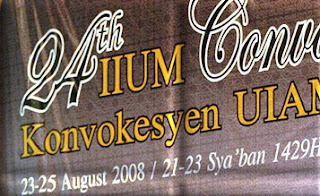 Once-in-a-life-time event, most people term the convocation so. I do agree. We may pursue our studies and may be attending many other convocation ceremonies, but, the undergraduate chapter will always be the most joyful and memorable. After a long awaiting, I can call myself a graduate now! Queuing outside before procession into the great hall, the sound of Malaysia’s national anthem ‘Negaraku’ followed by IIUM song “leading the way”, sitting among the class of 2008, waiting for my turn to receive the scroll, these are indeed great feelings of attending a convocation. Excitement and nervousness were dominating my mind alternatively since morning. Can I make it? What if I can’t? As some of you might know, I’m no fan of public speaking. “You are too soft-spoken”, a usual comment I get from people around me. I’m not the best amongst all but trust was placed upon me to represent the class as a valedictorian. I knew i have to try my best to project myself well in front of my parents, fellow classmates, fellow graduates and special guests of the great event. Those were my anxieties on the morning of 24th Aug, 2008. Anyway, at last, the stage is not that frightening anymore. I can not claim all the credits for the achievements. Four years in IIUM hasn’t been easy, and it would’ve been harder without the committed lecturers, friendly classmates, dearest friends and cheerful hostel-mates. To all my dedicated lecturers from KICT, from Department of General Studies and KENMS, (not to left out the co-cu trainers and SPICE), thanks for nurturing us with not only knowledge and skills but also with life experiences. To all my fellow graduates and classmates from KICT, it has been a great pleasure to get to know all of you and has the opportunity to study under one roof. I know I’m quite hard to deal with but my days at KICT have been enlightened with all your friendly faces. I value each moments with all of you. To my ex-roommates, with you all around, I was always filled with home-like feeling in 4 years hostel-life. Still remember all unforgettable memories like you all trying so hard to teach me Bahasa Melayu, cooking together during holidays, watching Korean-dramas overnight, going for shopping till we dropped, etc etc. To Myanmar students community (current & ex-), studying in a country without even a single relative around, you all have been my dearest relatives. Teristimewa buat para hadirin yang hadir pada hari ini, ibubapa, sanak saudara, serta sahabat handai yang tidak jemu memberi sokongan serta dorongan sepanjang kami berada di taman ilmu dan budi ini, Kehadiran kalian menjadi saksi kepada kejayaan kami. Kejayaan kami, sebernarnya kejayaan anda juga. 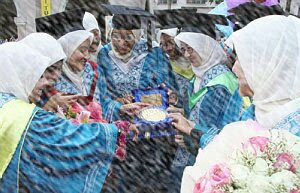 Akhir kata, sekalung taniah dan selamat maju jaya kepada semua graduan sesi 2008 (dua ribu lapan). Happy to see your wishes come true. najma..i know how far u can go and how good u can b..